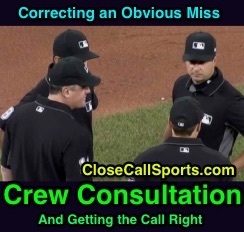 Crew Consultation and Getting the Call Right is an important officiating concept when an umpire's clearly incorrect call or mechanic occurs during a play that is to be reversed. Such a play occurred Tuesday in Toronto when Angels batter Kole Calhoun hit a sinking line drive to left field where outfielder Curtis Granderson attempted to make a sliding catch. As the the ball fell to the outfield turf, Angels baserunner R2 Zack Cozart ran toward third base as Granderson recovered and threw to third baseman Josh Donaldson, who tagged Cozart while off his base. 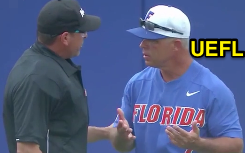 Immediately following the play, it became clear that 3B Umpire Mike DiMuro had incorrectly signaled that left fielder Granderson caught batter Calhoun’s batted ball on the fly. Video: Umps Reverse Catch Call in Toronto. Ok, so the umpire has made an incorrect call—he saw a catch by an outfielder who turned away from him, thus blocking or screening him from seeing the ball, and realized far too late that the ball was loose. Talking about positioning, timing, or any other mechanic won’t help now, because an improper call has already been made and the play already complete. During a game, knowing what to change mechanically won't help with a plainly missed call that has already been made. How is an umpire to fix such a mistake? The answer is crew consultation. We previously spoke of the importance of the call on the field relative to crew consultation and forming an initial call ahead of a Replay Review due to the importance of defaulting to an on-field ruling in the case of inconclusive video evidence ("call stands"). 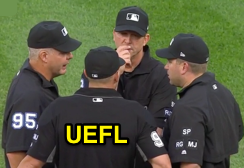 Related Post: Crew Consultation - Importance of the Call on the Field (6/22/17). The current discussion pertains to clearly erroneous calls to be corrected without the use of Replay Review (or a clear miss that the crew fixes on the field, thus making video review an inaccessible option). Crew Consultation: The answer to a problem. Upon consultation amongst chief Mark Wegner's crew, the umpires elected to rule baserunner Cozart out on the play at third base, and place batter Calhoun at first on the fielder’s choice. The NCAA rule is a bit more strict and precise. NCAA: The college rule provides a little more guidance for that level of play, which is different than the professional rule. Had this play occurred at the NCAA level, Appendix E entitled Getting the Call Right states that if an outfield call of “catch” is changed to “no catch,” then the ball is dead, the batter placed at first base, and each base runner is advanced one base from that occupied at time of pitch. Conversely, a “no catch” to “catch” reversal in college requires the base runners returned to their bases of origin and the batter declared out—no sacrifice flies are possible. Related Post: NCAA Rule - Reversing a Catch Call's Runner Placement (6/13/17). Under college's catch to no catch rule, the Angels would have had the bases loaded with none out. Regardless of level, it is important to know that umpire consultation is possible for certain clearly erroneous calls or those where a crewmate has additional information that could seriously help get the call right, such as trouble balls hit to the outfield, pulled foot issues between base and field umpire at first base, whether a batter has fouled a ball off a foot or leg at home plate, etc., while other calls (such as balls and strikes [pitch location]) should likely never result in a crew consultation.